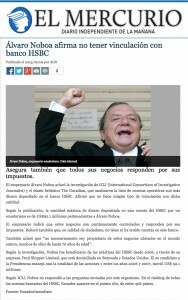 El Mercurio: "Alvaro Noboa claims to have no entailment with the HSBC bank"
The Cuenca (city of Ecuador) newspaper, El Mercurio, made yesterday a publication where Alvaro Noboa clarifies being unrelated to the Swiss bank HSBC. The newspaper article states that businessman Noboa has companies worldwide, so these develop their own bank accounts in the country where they are. On the other hand, it is mentioned that Mr. Noboa ensures the legal compliance of all companies in the Noboa Group, which fulfill their tax obligations. “I’m not necessarily the owner of these businesses located throughout the world, many of them of 70 years of age,” said Alvaro Noboa, quoted by the daily from Cuenca.